It's not exactly our first look at Mark Hamill in Star Wars: The Force Awakens, but it's pretty cool. The man behind Master Jedi Luke Skywalker climbed into the new First Order Stormtrooper armor to take fans by surprise on Hollywood Blvd. It was all done as part of the Omaze Star Wars: The Force Awakens initiative, and it's a lot of fun! And we may even be getting a sneak peek at Luke's new Star Wars: Episode VIII beard and haircut. Two weeks ago, we got a very cool video that showed the man behind the legendary space pirate known as Han Solo, Harrison Ford, participating in a video where he surprised fans. These trilogy originals are doing it all in the name of charity. Omaze has launched another campaign, and this time, the stakes for participants is pretty high. Those who donate to the cause will be entered to win a chance to meet the cast at the premiere for Star Wars: The Force Awakens. And to participate, you can visit omaze.com/StarWars by clicking Here. There will be two grand prize winners. You'll be transported to the red carpet premiere (Los Angeles or London). There, you will meet cast members, walk the red carpet, and experience the magic of Star Wars on a silver screen for the first time in ten years. Your flights and 4-star hotel are covered. And of course, this is all to support Star Wars: The Force for Change's mission, a movement to support the immense passion and goodwill of the Star Wars fanbase and promote change through inspiration, stories and meaningful partnerships. If you plan on getting in on this, you better hurry. You only have a few days left! In the latest video released in support of this new charity campaign, Mark Hamill took a stroll down Hollywood Blvd. There, he ran into Darth Vader, offered a sneak peek at his dance moves, and even payed homage to the classic scene in Star Wars: Episode IV - A New Hope, where Luke and Han disguise themselves as Stormtroopers on the Death Star to save Princess Leia. The Star Wars: The Force for Change initiative started last year, and raised over $4.2 million. Anyone who donates $10 or more in this new campaign will be entered into the premiere contest. And they may even get to attend an after party with everyone involved in the movie. These $10 donations will go to benefit over 15 different charitable organizations, each chosen by a different member of the cast and crew. You can read the full list of charities here. 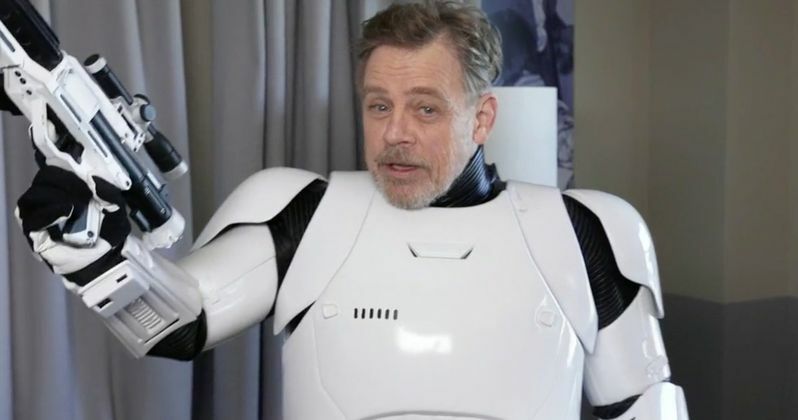 You can take a look at the video below, which has some fans literally blown away when Mark Hamill finally revealed himself on the street. This is such a fun time, and only makes the wait for Star Wars: The Force Awakens that much harder.